Heat oven to 350°F. Place oats, coconut and almonds on 15x10x1-inch jelly-roll pan. Bake, stirring often, for 15 to 20 minutes or until mixture is golden brown. Place mixture into large bowl; stir in dried apples. Set aside. Combine corn syrup and Cinnamon Sugar Butter Spread in 2-quart saucepan. Cook over medium heat until mixture comes to a boil (1 to 2 minutes). Cook 1 minute; stir in marshmallows. Continue cooking, stirring constantly, just until marshmallows are melted. Pour mixture over toasted oats mixture in bowl; stir until combined. Cool 5 minutes. Coat hands with Cinnamon Sugar Butter Spread; shape mixture into 1-inch balls. Store in container with tight-fitting lid. For granola bars, press mixture into buttered 9-inch square pan. Cut into bars. 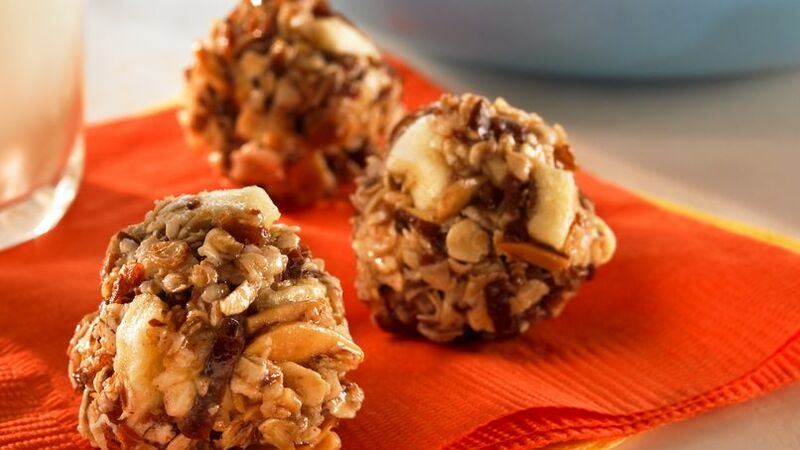 Toasting the oats and nuts really makes these healthy snacks special!